The adventures of two small families and a big bunch of vegetables. 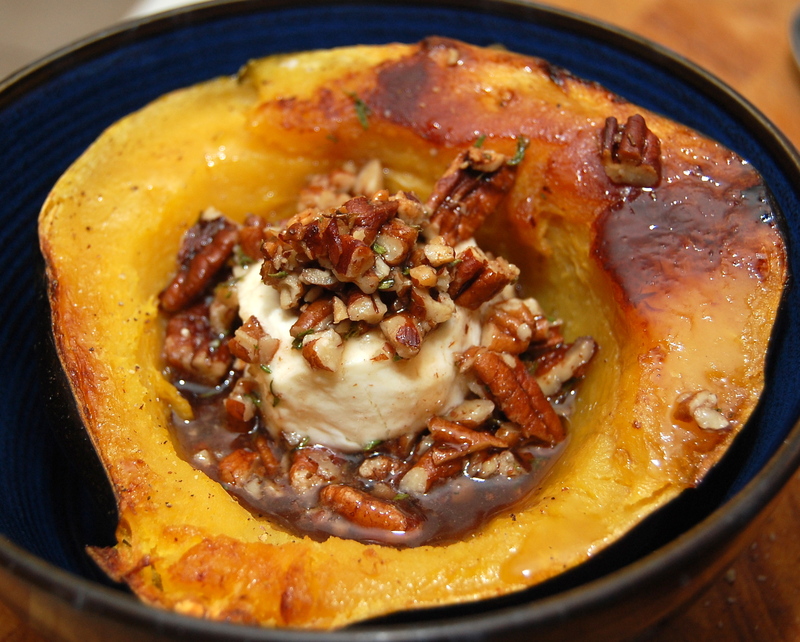 This is another great veggie recipe that we use when we get a lovely big acorn squash in our CSA box. The recipe is from the Georgia Pecan Commission. It is simple as can be. Slice a squash, seed it, brush with olive oil and bake cut side down for half an hour. Flip over, add a mixture of chopped pecans, thyme, and maple syrup (I add a teeny bit of salt, too) layer in a thick slice of goat cheese, and top with a bit of pecan mixture. Bake for another ten minutes. I know I’ve been bacon-free for a few days now, but seriously – would this be better with bacon? Just a little crumbled bacon in the mix to offset the sweet? I may have to find out. Paleo Banana Pancakes, My Style! Recent reviews by Michelann Q.